This past week has been particularly exhausting as I have been out and about visiting regional Kier offices and external agencies. However, I was definitely most excited about my Friday appointment as I was invited by my Human Resources colleagues to present a Digital Marketing Workshop at LinkedIn's London office. 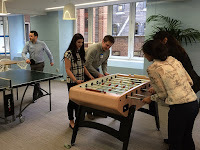 This has only been open for about six months and is definitely designed to impress clients with it's London theme (including an underground room and desks with built in 'Boris bikes' which charge your mobile phone). Needless to say we made the most of the exciting new surroundings! As a department our HR team has always been a priority of mine when ensuring the business engages digitally. Job searches are consistently in the top three on our website (as with everywhere I've ever worked) so streamlining the user experience is paramount. I've also noticed a trend of companies recruiting for 'Resourcing Digital Marketing Managers' who are given the responsibility of developing and delivering a significant upgrade to a company's recruitment and digital attraction assets. This goes beyond new customer acquisition as everyone competes for the very best talent available. Use tools to take away the manual process and filter the best fit candidates - Tools such as LinkedIn recruiter are an excellent way to find your next employee of the month. You can filter by location, experience or job type and it even allows you to use an exemplar employee for a search to find someone else just like them! To present yourselves as the best employer over your competitors you will need a mixture of all of the above as we're not all blessed with the fantastically modern offices of Tech companies (with table tennis tables and free snacks in every corner) such as LinkedIn!